... Wilt Chamberlain. 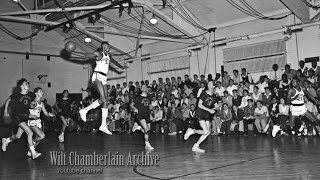 ... 17 year old Wilt Chamberlain CATCHES a shot and runs the fast break. ... a blocked shot, and 3 points. He's only 17 years old in this footage. Wilt Chamberlain was an American basketball player He played for the Philadelphia San Francisco Warriors the Philadelphia 76ers and the Los Angeles Lakers. 75 year old Jerry West "I haven't shot a basketball in years"
Bill Russell jumps OVER a guy from near the FT Line - INSANE speed and hang time!